Banks that long ago spearheaded the online deposit platform posted double-digit increases in deposits year over year, outpacing growth at the country's biggest banks. A number of traditional banks have launched online accounts to entice new customers, but these big banks are starting years behind their digitally native peers. 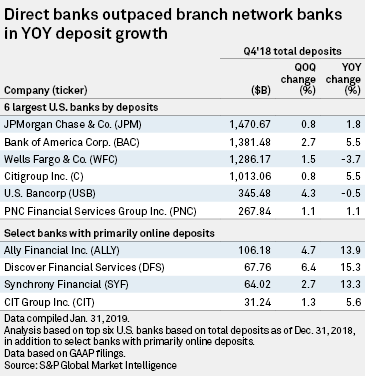 Even as branch-based banks crowd the market for digital deposits, one Discover Financial Services executive said the company, which ramped up its online products back in 2009, remains unfazed by the new entrants — at least for now. "It's very early days," Arijit Roy, vice president of deposits, said in an interview. "Maybe the effect will take a little bit of time to play out ... but we're not seeing any type of adverse effects or slowdown [in our deposits]." Discover grew its deposits by 15.3% year over year in the fourth quarter of 2018, and digital peers Synchrony Financial and Ally Financial Inc. both grew deposits by more than 13%. The largest banks in the U.S. saw about 5% growth or less, and Wells Fargo & Co. and U.S. Bancorp saw their deposits decline year over year. The Federal Reserve raised interest rates four times in 2018, and branch-based bank executives have noted a slowdown in non-interest-bearing deposit growth given the rising-rate environment. But some companies, such as Goldman Sachs Group Inc., and later Citizens Financial Group Inc., have found success in targeted digital offerings. Marcus by Goldman Sachs, a digital high-yield savings offering for consumers, launched in October 2015. In the three years since, Marcus has raised $35 billion in the U.S. and the U.K., according to a company spokesperson. That would make it the 43rd-largest bank in the U.S. by deposits, clocking in just below Signature Bank at $36.1 billion, according to an S&P Global Market Intelligence analysis of third-quarter 2018 financials. Citizens Access, which has a minimum account balance of $5,000, raised funds from all 50 states within weeks of launching. It raised about $3 billion in deposits in the first six months, surpassing the company's goal by $1 billion. And Ally ran an "aggressive" promotional offering that led a portion of Discover customers to move funds to Ally accounts, Roy said. Following that promotion, Ally recorded its best quarter on record for deposit growth in the fourth quarter of 2018. Big banks such as JPMorgan Chase & Co. and PNC Financial Services Group Inc. are launching online and mobile products in an attempt to keep customers who want a more technology-based experience. Still, most of Discover’s new deposits come from traditional banks with branch networks, Roy said. PNC Chairman, President and CEO William Demchak said his bank pulls deposit share from smaller banks, according to a transcript of the company's fourth-quarter 2018 earnings call. PNC launched an online banking strategy in July 2018. The regional bank, which is concentrated in the northeast, plans to use the new online offering to gather deposits in certain geographies before cementing its presence in those markets with physical branches. Today, online deposits are "such a small number" of PNC's total deposits that it has yet to affect the bank's beta, Demchak said. While traditional banks such as PNC are adding competition in the online marketplace, Demchak said PNC has yet to see "massive competition" for traditional deposits, or deposits gathered from people looking to bank at a physical branch. For the traditional banks, deposits shift based on services, not because of the interest rate a bank offers its customers, Demchak said. But much of the fight for deposits from digitally minded consumers focuses on the interest rate that banks pay their customers. Marcus and Synchrony currently offer an annual rate of 2.25%, while Citizens Access pays 2.35%. Ally carries 2.20% on deposits, and Discover offers 2.10%. Discover's Roy said the card company will "never" be the rate leader. He highlighted the "distinctive customer experience" with Discover's call centers, customer service and mobile app as differentiating the company in other ways. "There are millions of customers around the country that carry our logo in their pockets," Roy said. "Because of our card relationship, [we do] not have to lead on rate."